An S&S coupler is a type of connector that is installed in certain types of bicycle frames to allow for the bike to be separated into two halves and packed away for easy transportation. With this type of connector installed, a full size road, mountain or touring bicycle can fit completely inside a single 26″ x 26″ x 10″ case/cardboard box that travels as regular airline luggage. The Co-Motion Pangea Co-Pilot that I’ve been using on my bicycle tour across Europe is one such bicycle that can be equipped with S&S couplers and transported in this manner. In the video above I will show you the box I flew my bicycle in while recently traveling from Zurich, Switzerland to Istanbul, Turkey. I will also show you the steps involved in putting a bicycle with S&S couplers back together again after it has been split in half. Finally, I will finish by showing you the steps necessary to assemble your touring bicycle after flying with it on an airplane. Rather than watching the whole video above, however, I recommend reviewing the time markers below and then skipping to the parts of the video that interest you most. The two halves of the bicycle coming together with the use of S&S couplers, for example, begins at the 17:40 mark. There are two major things I learned from putting my bicycle back together in the video above. If you watch the video above you will see that I was unable to figure out how the two derailleur cables were meant to reconnect with one other. What I failed to realize at the time, but figured out just moments after the video recording had stopped, was that in order to reconnect the cables I simply needed to shift the gears on both sides of the bike to their lowest possible position. Doing this added the length to the cables that I needed in order to simply grab both sides of the cables with my hands (no special tools were needed) and screw the cable connectors back into place. Finally, recording this video has given me a record of just how long it takes to put a touring bicycle back together again after it has been split in two and fully dissembled. While I did take a little time during the video recording to snap some photos and gather tools in the next room, the video is proof that the process of putting a touring bicycle with S&S couplers, fenders, racks and a handlebar bag back together again can be done in about sixty to ninety minutes. This entry was posted in Bicycle Touring Pro Articles, Bicycles, Featured How-To Articles, Main Articles, Products, Videos and tagged co-motion coupler bicycle, co-motion folding bicycles, co-motion pangea, co-motion s&s couplers, coupler wrench, S&S coupler, s&s couplers, S&S machine, stainless steel couplers, stainless steel pipe fittings, travel bike. I am really enjoying Bulgaria and Romania. This might be a question that other readers will have. What is the main advantage to the smaller container that you can pack a bike with couplers in? Don’t you still need to procure a box that you will probably discard at the airport or your first stop after the airport? Then at your destination you need to find another box, just a smaller one than a bike shop would probably give you for free. There is probably an advantage that someone that hasn’t done it yet is missing. What makes it worth the extra expense? Walt, the advantage to having a bicycle that fits inside an airline friendly suitcase like my Co-Motion Pangea is that you don’t have to pay shipping to fly your bicycle. It’s that simple. With the cost of flying your bike going up and up and up (some airlines how charge as much as $350 USD per direction) to fly your bicycle. Having a bike like mine on a round-trip trip like that would save me $700 USD with that one RT flight alone. That’s it! What do you do with the suitcase while you go touring? Carlos, in my case, there was no suitcase. Instead, I used a cardboard box to pack and fly my bicycle. See here. I just unpacked the bicycle and then threw the cardboard box in the trash. If you were to use a suitcase, however, you could ship the empty suitcase to the end of your tour to pick up later… or you might simply be doing a circular bike tour where you are start and end in the same city. For example: You might fly from Los Angeles, CA, USA to Madrid, Spain with your S&S bicycle in a box. Then, once you get to Spain you would assemble your bicycle and leave the bike box at a local hotel. You would spend a couple weeks riding around Spain and return to Madrid and that same hotel a few weeks later, where you would then pack up the bicycle and fly back home with it. Thanks for this video. It show us without shortcuts how to assemble this bicycle. After a while, you probably became efficient and familiar with your bicycle’s mechanic. I have to admit that travelling with this relativly small box containing your bike makes it simpler to take a taxi, a bus and safer to travel by plane, transiting in various airports. As you said, it is also cheaper to carry it. In my case, dismantling and re-assembling (twice) my bike represent a lot of work because I rarely travel more than 3 weeks in a row and mostly in America. I generaly use my car to reach my starting point. 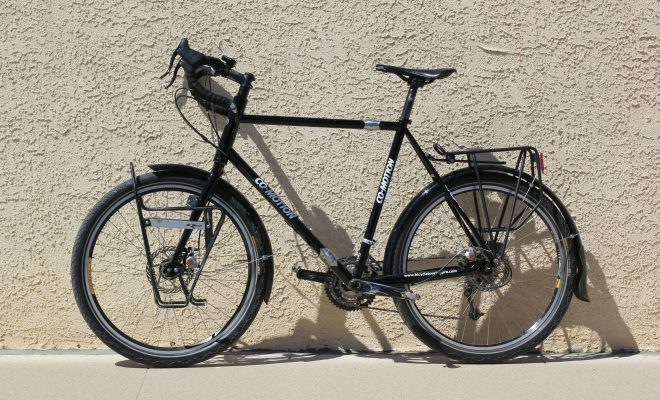 Maybe Co-Motion should develop rear and front racks adapted to their bikes that could be installed and removed in a second, samething for the fenders. About finding a cardboard box for your bike: I found myself in Kona, HI in 1981(?) looking for a bike box but was told there was this big bike race the day before and all the bike boxes had been taken. Later, I learned about the Ironman. My solution was to go down to an appliance store for a refrigerator box which I proceeded to cut down and tape up. Worked just fine!